One of the most effective & durable line of professional fly traps. 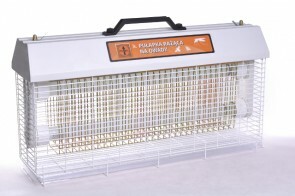 The PR2 series is known for its reliability as an electric insect killer / fly zapper. It uses UV-A tubes radiation to attract flying pests and high voltage striking grid to exterminate them at the highest efficiency rate. These EFKs (Electric Fly Killers) are designed for the most difficult conditions, including farm and agricultural buildings, plant farms and other storage facilities, non-food shops. Thanks to durable construction including shatterproof lamps and IP 44 protection rate, they are highly resistant to damages (which quite likely to occur in such conditions) as well as deteriorating influence of dust and humidity. Our PR2 electric insect exterminators, at relatively compact dimensions, cover up to 200 m2 at maximum power consumption of 72W. They are a highly effective and universal solution of flying pest problem in diverse conditions.